Jon Johnson Photo/Gila Valley Central: The Thatcher Eagles move on to the second round of the 2A state playoffs after defeating Willcox, 62-6. The Eagles will host the second round game Friday, Nov. 10, starting at 7 p.m.
THATCHER – The Thatcher Eagles’ quest to repeat as 2A State Champions moved one notch further Friday, as the No. 3 Eagles (8-1 conference, 10-1 overall) destroyed the visiting No. 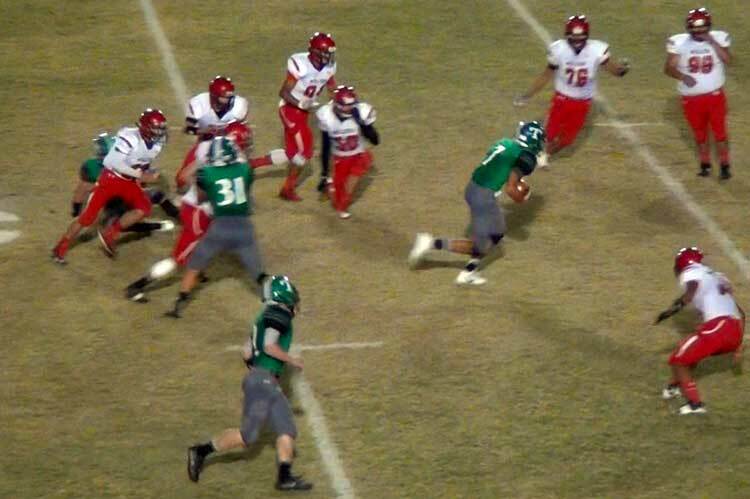 14 Willcox Cowboys (3-6 conference, 5-6 overall), 62-6 . . . and it wasn’t even that close. Jon Johnson Photo/Gila Valley Central: The Eagles sing to victory. Willcox opened it season traveling to Thatcher for a severe beating (52-6 on Aug. 19) and it ended its season the same way. The Cowboys, who were down five players who were suspended for the game due to fighting in their previous loss Oct. 27 to Benson, 43-22, saw their season zoom by in a green blur as nine different Eagles scored touchdowns, mostly on big runs. Jon Johnson Photo/Gila Valley Central: A cheer leader shows her spirit. After both teams coughed up fumbles on their opening possessions, the Thatcher defense forced a punt and its offense headed back onto the field. 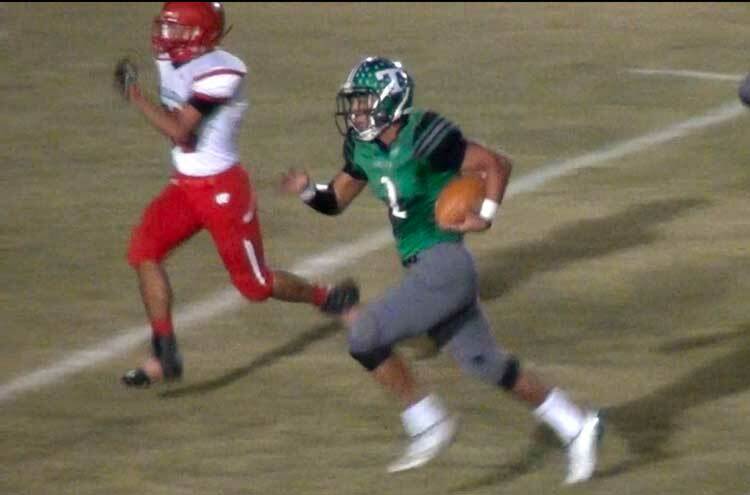 Quarterback Tyler Roebuck didn’t waste any time and opened the scoring on the night with a 64-yard keeper in which he weaved his way through Willcox defenders and then flat out beat the defensive back to the corner. 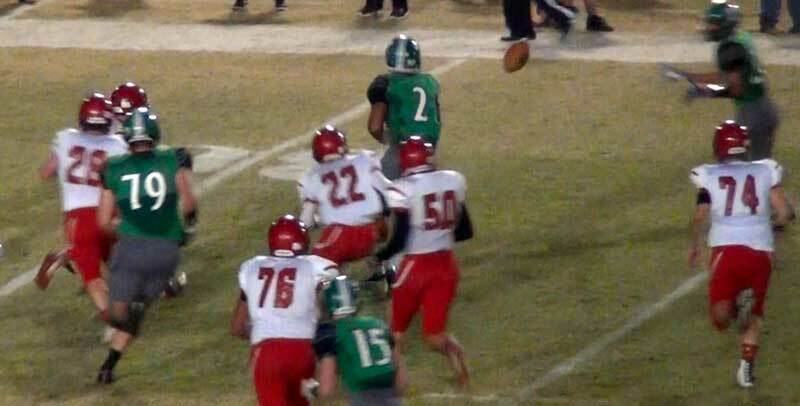 Thatcher was poised to score on its next possession as well after again stifling the Willcox offense into punting from its own end zone to the 25-yard line. But after Rulon White corralled Roebuck’s pass on first and 10 from the 11, the ball squirted out as he attempted to cross the end zone and the fumble turned into a touchback. The defense took the ball back again on a fumbled snap and Brock Jones made the most of the turnover by scoring on a 20-yard run to put Thatcher up 15-0, still in the first quarter. When the Eagles put their foot on an opponent’s neck, they don’t like to let up until there is no chance at a comeback and on the ensuing kick off recovered the onside kick. This time it was Bretton Dodge who took it in from 33 yards out to put Thatcher up 22-0 as they headed into the second quarter. Jon Johnson Photo/Gila Valley Central: Tyler Roebuck pitches to Bretton Dodge, who took it 33 yards to the house. Thatcher would score three more times in the second quarter, with Shane Cooke getting in on a 26-yard run, Javan Montoya taking a pass from Willcox transfer Jack Kortsen 30 yards to pay dirt, and Riley Morris busting off the second-longest run of the night for a 63-yard TD. While Thatcher was scoring touchdowns, the Cowboys were turning the ball over left and right. Willcox had four punts, two fumbles, a turnover on downs and a superb interception by Bretton Dodge all in the first half. As the teams went into halftime, Thatcher was up comfortably 42-0 and the Thatcher faithful were taking bets to see if Willcox would come back for more in the second half or head out on their bus early. 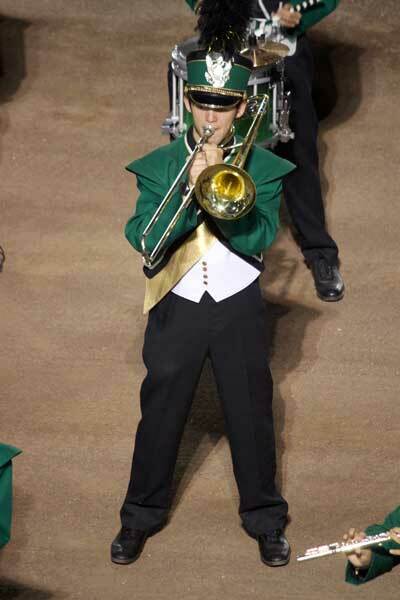 Jon Johnson Photo/Gila Valley Central: The band played for the Eagles’ victory. Willcox head coach Alonzo Highsmith said he thought his team wasn’t mentally ready to take on the Eagles in the playoffs. Willcox did return for the second half, but with a running clock and against Thatcher’s reserves and junior varsity players the results mostly stayed the same. Thatcher scored three more times in the second half on a 5-yard TD run by Tevan Clark that he set up himself by returning the second half kickoff to the 9 before being tackled by a horse collar, a 45-yard romp by Kortsen, and a 1-yard plunge by freshman Michael McBride. By the time the fourth quarter rolled around, there were so many junior varsity players in the game the announcer had to ask for help for their names. Things also got slightly confusing when it was realized that some of the JV players had the same numbers as the varsity players. Jon Johnson Photo/Gila Valley Central: Tyler Roebuck makes his way past the defensive back for an 64-yard opening score. Kortsen said he enjoyed getting the chance to play against the Cowboys since he missed the first game due to having to sit out the first five games because of transfer rules. Willcox never gave up, however, and, aided by some penalties on Thatcher, the Cowboys avoided the shutout as A.J. Fuentes hit Jesus Juarez in the back of the end zone for a 10-yard TD, ending the game, 62-6. Jon Johnson Photo/Gila Valley Central: Jack Kortsen sticks it to his old team with a 45-yard TD. Kortsen also passed for a TD earlier in the game. While having a couple of drives to mid-field and the last touchdown drive, Willcox had so many negative plays that its total net offensive yards were reportedly only 1 yard for the entire game. Penalty yards do not count toward offense. Always seeking to improve, Hinton said while he was happy with the win his team can do better. 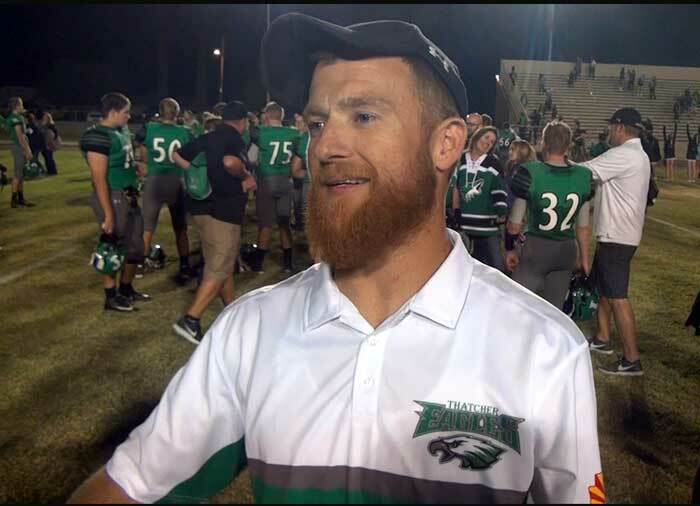 Two of Thatcher’s three fumbles did seem to be just sloppy plays, but that paled in comparison to Willcox’s four turnovers and seven punts on the night. “We played pretty good, but we still made too many mistakes,” Hinton said. Jon Johnson Photo/Gila Valley Central: Thatcher head coach Sean Hinton was pleased about the outcome of the game but said his team could do better. Thatcher will next host the winner of Saturday night’s game between No. 11 San Tan Foothills and No. 6 St. Johns. The game will take place Friday, Nov. 10 at John T. Mickelson Stadium, starting at 7 p.m. Thatcher previously dispatched St. Johns on Sept. 29, 56-18. 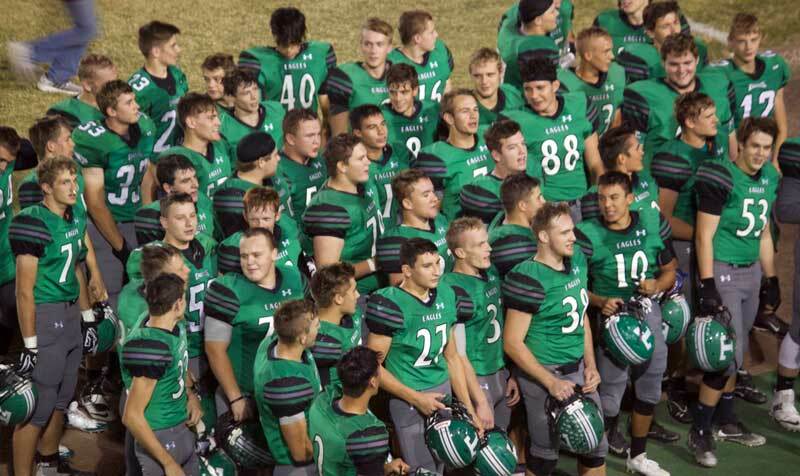 The Eagles didn’t play San Tan Foothills during the regular season. Hinton said no matter who the opponent will be, they will be ready.